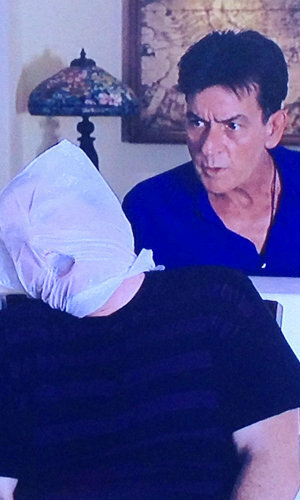 Never let it be said that Charlie Sheen hasn't ever been a nice guy. It's just that even the "Anger Management" star's attempts to be loving and protective of his family come with a dose of craziness. Sheen, 47, took to Twitter on Wednesday to defend Denise Richards, his ex-wife and the mother of his daughters Sam and Lola, from reports that she's becoming scary skinny. He wrote an eloquent message to express his displeasure. "listen up sad, dooshy media STOP the inane reports of Denise's weight! She's SO healthy!" And here’s the kicker: Sheen also added, "this guy didn't listen," and a link to a pic that showed him suffocating a man in a plastic bag. Um … is that supposed to be funny? Sheen made another questionable move on Twitter in March (again in a somewhat misguided attempt to protect someone he loves) when he issued a "call to arms" to his nearly 4.5 million followers to strike back at the school his daughter Sam had been "bullied out of." "if you have a rotted egg a roll of toilet paper or some dog sh--; I urge u to deliver it with "extreme prejudice" to their KamPuss run by trolls and charlatans. make me proud," Sheen wrote. It's probably in the actor’s best interest to sign off from Twitter for good — what with his odd hashtags and willingness to talk about anything anytime – but reading his feed is just so entertaining!